Eating a diet rich in fruits and vegetables may help reduce the risk of many diseases, including heart disease, high blood pressure and some cancers. It’s not wonder why health professionals like Registered Dietitians are always encouraging these foods in all diets. Here are 5 more reasons to get more fruits and veggies on your plate! Low in Calories big on taste: Add texture, flavor and volume to your plate with plenty of fruits and veggies with minimal added calories. Convenience: All forms of fruits and vegetables fit into a healthy eating plan – fresh, canned, dried and 100% juice. Don’t forget about frozen veggies like Woodstock Organic vegetables – the ultimate addition to a quick meal. Fiber: Fruits and vegetables provide fiber that helps fill you up and keeps your digestive system cruising smoothly. Vitamins & Minerals: To keep you healthy and energized. Quick, Natural Snack: Fruits and veggies are nature’s treat and easy to grab for a snack! In 2-quart saucepan over high heat, heat chicken broth to simmering; keep warm. Meanwhile, in 3-quart saucepan over medium heat, in hot olive oil, cook onion until tender-crisp, stirring occasionally. Add rice and cook for 2 minutes until coated with oil. Gradually add chicken broth, 1/2 cup at a time, until absorbed, stirring frequently. Continue adding the remaining broth, 1/2 cup at a time, stirring occasionally, cooking the rice until al dente, about 25 minutes. 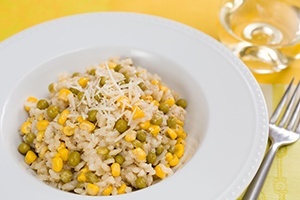 Stir in corn, peas Parmesan cheese and butter to heat through. Add salt and pepper to taste. Serve immediately.